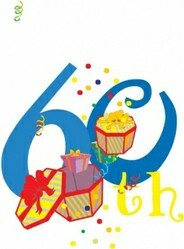 Turning 60 is a special event and takes planning and time to celebrate. There are many different 60th birthday gift ideas available, and this article lists the best of them. 60th Birthday is no doubt a special occasion and if any of your loved ones are turning 60 soon than make sure that you have an equally special gift to give them. Listed below are some ideas that will help you decide the best gift for 60th birthday. Have a look. Elegant engraved wine glass set. 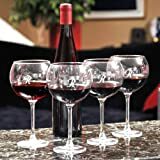 Amazon has a large selection of these glasses to choose from; engraving them with the name of the recipient makes this gift idea even more special. Personalized gold or silver picture frame. Choose an 8x10 frame and place a special picture inside, such as a wedding photo or pictures of their grandchildren. Sterling silver engraved heart locket pendant. Available at amazon.com, this gift idea is perfect for the woman who has everything and is a special memento of their 60th birthday. Men’s Stainless Steel and Black Rubber Medical ID Bracelet (exclusively at Amazon). This is among the best 60th birthday gift ideas and is ideal for any man who has a health condition like diabetes or a food allergy. Birth year gifts. Frame a magazine or newspaper cover from the year they were born. Or, search online for a “what happened during the year you were born” gift. “This is your life” scrapbook. For the birthday recipient who has everything, create a special “This is your life” scrapbook; include photos from their life, embellish with journaling and pretty details for a very special gift idea. Food or wine of the month clubs. This is one of many unique 60th birthday gift ideas. Choose a food or wine that the recipient favors for a gift that gives all year long. Personalized gift basket. Add in favorite foods, coffees or teas and present in a large and festive gift basket. “Meaning of your name” framed print. A sentimental gift idea, make sure you frame it in an elegant gold or sterling silver frame to make it even more special. Framed poem. If you’re not good at writing, you can hire someone to pen one for you or use a famous poem that the recipient favors and have it framed. Place in a lavish gift box for presenting. Vintage wine. If you have the budget, search for a bottle of wine that was made during the year of the recipient’s birth. Fine wines get better with age and this idea is perfect for the wine connoisseur. I would go for the gift basket, it looks so yummy. ah I have to buy my partner something for this birthday this year (yikes!) - quite like the "year you were born" one!